- At last! 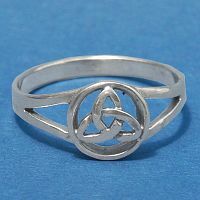 We've found a finger ring with the triquetra symbol on it! Cut out design features a three-part knot inside a circle. Ring is 3/8" across at its widest point, and just under 1/8" at the narrowest. Available in whole sizes only. Choose Size... Size 6 Size 7 Size 8 Size 9 Size 10 Size 11 Size 12 Please choose the Size. Do you have any other questions about our Silver Triquetra Ring? My ring is pure magic and beautiful yet simple. I love it! This is my 2nd ring I've purchased from this site. I'm in love with it! Thank you for an amazing ring! I got 2 of these rings i gave one to my sister and she loves it. I love it as well. looking forward to getting more of your jewelery. Thank you so much and i didnt even wait long to get my order. 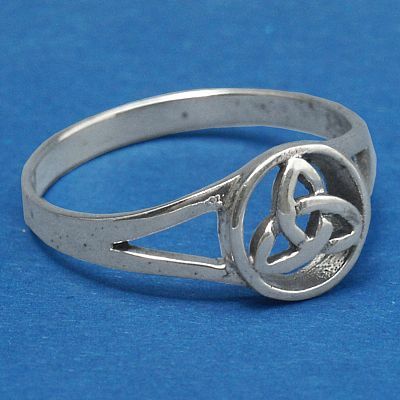 its the only ring i really ever wear. and i wear it all the time! I absolutely am in love with this ring. It fits my tiny finger just right. The only thing I would change is instead of being made out of silver being made out of platnum or white gold. I love it just the way it is all in all.